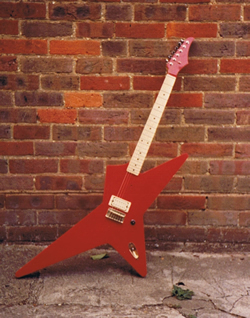 Many years ago I built a guitar from scratch, making my own body and using a Stratocaster copy neck. 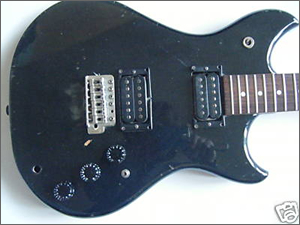 It played ok, and was “of its time” but after that initial flurry of sawdust and bad wiring I didn’t really dabble in guitars apart from changing the odd pickup and general maintenance. Over the years however, I have been a prolific builder of model cars, which has given me the ability to paint and modify stuff, and also a quite enviable collection of small tools and useful bits and pieces. Just recently I have fallen in love with guitars again. I have never stopped playing (guitar and bass), but my son has become an avid and proficient player and enthusiast, which has re-awakened my interest in guitars and collecting. 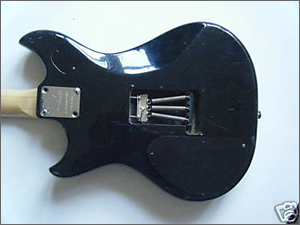 So one day while surfing around Ebay I found a knackered old Westone Thunder 1T guitar being sold as a project. It was in very poor condition, with many missing bits. As the buyer says in his own words.. I won the auction for Â£46 plus Â£15 postage and the guitar was with me within 4 days. Next post I’ll tell you all about the work ahead in detail, and my ideas for the rebuild.